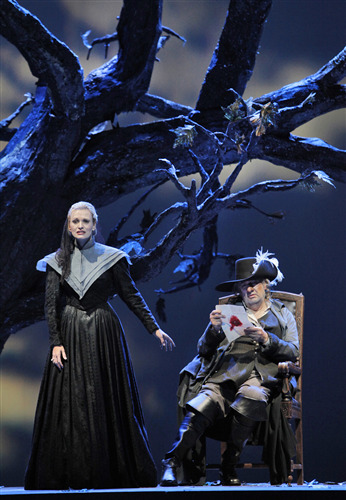 If it is possible to attend a performance of the almost-forgotten Cyrano de Bergerac by Franco Alfano, it is partly thanks to one who, in his more than 50-year long career, has devoted his life to opera. This is, of course, Plácido Domingo. As he himself explained during the press reception at the San Francisco Opera, many years ago he saw a Ricordi piano reduction of the opera, and was immediately captured by its powerfulness. In the years following, he spread the knowledge – and the love – of this rarely performed opera, taking on the title role at Covent Garden, at the Met, and in Valencia, among many other houses. The current production at the San Francisco Opera reunites Domingo with conductor Patrick Fournillier and director Petrika Ionesco, who together had already successfully participated in the premiere of this production at Théâtre du Châtelet in 2009. Ionesco's staging – he was responsible for both setting and lighting – was a rarity for me: it worked from beginning to end without any low points. The action started before the lowering of the lights, with actors as servants sweeping the floor and dancers warming up. The continuity between the pre-performance action and the beginning of the opera was played out harmoniously. As the curtains rises, we find ourselves facing the backstage of the theatre of Hotel de Bourgogne, and are able to witness all the mechanics behind a theatre show: actors and dancers rehearsing, divas and divos complaining, and machineries revealing the manufactured illusions of any play. 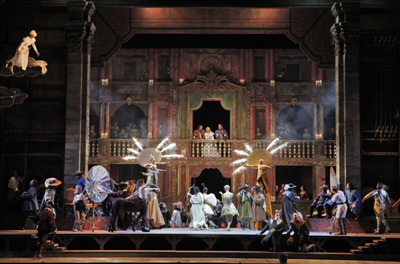 A play in front of an audience on stage begins, until Cyrano arrives, in the first of his many disruptive entrances – very effectively staged and acted with spontaneity and elegance by Domingo. The staging also suggestively supports the few words from Henri Caïn's libretto depicting the places of the play: in "Paris fuit, nocturne et quasi nébuleux," we listen to Cyrano singing of a nocturnal Paris swallowed up by the fog, and we have an unpretentious but suggestive blue backdrop with the characters standing still as in a painting. Moreover, through the use of hanging elements and vertical constructions – such as the huge cake in the Ragueneau Bakery in Act II – the multi-dimensionality of the space was successfully visible. Ionesco's production cleverly thematizes many aspects of Rostand's play, such as reality as an artifice and therefore comparable to the world of theatre; the triangulation between the main characters; the spectacularity of the world of theatre versus the intimacy and deceiving truthfulness of poetry. The artificial construction of the personality also materializes on stage by means of the incisive use of two reflecting mirrors, during the scenes in which the manufacturing of the "romantic hero" – Cyrano's eloquence combined with Christian's good-looks – is most painfully, and ironically, explicit. As for Domingo – "what is there left to say? ", Roger Parker wrote a few years ago after a stunning performance of Cyrano in Covent Garden. One of the possible answers is that Domingo makes sure there is always so much left to say about his musical self. The class and the naturalness in which he embodies this role are tremendous: a clever singer such that he is, he knows that Cyrano – the indignant, romantic poet-musketeer – is just the perfect role for him at this stage of his career. There is no need to say that, vocally, the Domingo to whom we listen now is a 70-year old singer – and, especially for this, one is astounded by his performances. He was at times overpowered by the orchestra – although, admittedly, most of the male characters were, so that is perhaps something that has to do with the orchestration. In addition, before the start of the second act, General Director David Gockley appeared in front of the curtain and announced that the tenor was actually indisposed but decided to continue anyway, and the audience cheered warmly to show their appreciation for Domingo's professionalism. His voice was understandably strained at times but, frankly, who concentrates on that when his colour and expressiveness can still pierce and move so deeply? His Cyrano was a fierce, sarcastic, and elegant musketeer – both when fighting in the battlefield and defending himself against his adversaries and those who scorned him. The tenderness and resignation he portrayed in his relationship with Roxane, and with her lover, were overwhelming. In the balcony scene, and the final scene, Domingo was both vocally and dramatically astounding (and this particular member of this audience confesses to have been crying for most of the last act). Spanish soprano Ainhoa Arteta was vocally the most powerful character: she was one of the few who could master Alfano's vigorous orchestration. Her vibrato was a bit too wide for my tastes, but she was always precise in her phrasing. On the other hand, I felt she could have been more charismatic in her portrayal of such an nonconformist character – a 17th century woman who is not content for the tired formulas of courtship, and overtly demands to be put under the spell of embroidered and refined words in order to be able to fall in love. Thiago Arancam's SFO debut was a successful one. If his characterization suffered from some cliché mannerisms and predictability, this is perhaps because of the role he was interpreting. His timbre was bright and he delivered his lines with ease. As I mentioned above, he was not so powerful as to overcome the orchestra in the most climatic moments, but his performance was nearly flawless. The comprimario characters that Alfano maintains in his Cyrano are numerous. In this performance, the majority were effectively portrayed. Stephen Powell's was for me the one who especially managed to give the role of De Guiche, a multi-dimensional shape: he was convincing both on the dramatic and on the vocal side. Adler Fellow Leah Crocetto, one of the SF audience favourites, was a charismatic Lisa; the same was for Maya Lahyani's Duenna and Sister Marta. Brian Mulligan's Ragueneau suffered from a slightly light timbre – too naïve for such a role. On the other hand, he wonderfully inhabited the space on stage, becoming almost a symbol for the bitter and sarcastic side of this opera. The San Francisco Opera Chorus, led by Ian Robertson, did not disappoint his audience – as always. Moreover, the musicians all worked harmoniously with the real sword fighters on stage, coached by Master of Arms François Rostain. The hard work they have been doing in order to prepare the fight scenes (described in detail in the liner notes) was manifest on stage; ensemble scenes were a mix of dancing and fighting that really made this production a special one. Alfano's score is a heterogeneous one, and because of this he received sharp criticism for this opera. During the intermission, my friend and I kept mentioning all the composers that seemed to materialize: Stravinsky, Shostakovich, Janáceck, Berg, Debussy... these are only a few – and, interestingly, none of them are Italian. In the end, any medley of composers fails to describe Alfano's opera. Indeed, the score is problematic. Yet, the melodic lines convey the intensity of the events Rostand described, and some musical moments are truly memorable. On the other hand, I confess that it was also the merit of this particular cast and of Patrick Fournillier who managed to bring this work to its highest levels. In particular, a sudden unison of the strings in Act I was striking, and brasses during the battlefield scenes resounded with precision and clarity. Fournillier knows this opera very well, and his work with the SF Opera Orchestra gave great results. And if Alfano's Cyrano can be accused of being at times overemotional, during this performance the pathos truly came out; but, it was never for the sake of sensationalism, and always in service of the dramatic economy of the whole opera.